In the middle years of the 1990s every company that had not already done so built a 3D engine to enter the new world of gaming. With 3D arcade games wowing audiences worldwide it was natural that everybody would be excited to see this new dimension come home on the next generation of home consoles. Gungriffon started off as one such project at Game Arts, starting its development with the vague working title 3D Polygon. The game released exclusively on Sega’s Saturn worldwide in 1996. The game’s events take place in 2015 (what??? ); so when you play it, make sure the right side wins this mech war! Gungriffon is a game that would feel right at home as an upright cabinet in an arcade. It really has that feel to it. It is a mech combat game, with a fairly limited set of controls built around the Saturn’s controller. This actually helps the game keep a simple design while still giving the player tools to easily navigate the levels. There are only six levels in the game, and each one is essentially a box you can openly move around in. Most of them will last less than ten or fifteen minutes. This game is a popular import. It requires little Japanese, and the only text you have to worry about is a mission briefing before each level. The first batches of levels just involve you killing every enemy in the level, but the objectives of later levels varies from destroying a specific target, to protecting your allies. This could confuse those who opt into a cheaper Japanese copy and wonder why they keep failing some of the levels. By virtue of being a mech combat game the controls do take some getting used to, but once you do its quite easy to maneuver and make your way from one end of a stage to the other in a much smaller amount of time than you’ll think. The music in the game is excellent, and I found myself just relaxing at the mission select screen for a few minutes between every stage. Gungriffon goes for a more realistic atmosphere when you’re on the ground stomping around and blowing up enemy tanks, transports, air support, and mechs! You hear a lot of radio chatter and the sounds of your mech whirring as it walks like the giant robot it is. This game does have some of the best 3D on the Saturn, with all enemy designs being clear and detailed for its time. It even looks better and runs smoother on the Saturn than the Mechwarrior ports to the Playstation! Game Arts always manages to pull the most out of the systems they work for, and its quite surprising to see this run so smoothly on a Saturn. A common thread I’ve noticed in games for the system is that there are small areas in games that just weren’t fully optimized, and slowdown occurs as a result. I never encountered any slowdown in Gungriffon, and its more detailed than some 2D Saturn games I’ve played that have this slowdown problem! If you’re looking for a great game to add to your Saturn collection then consider Gungriffon, its a joy to play and is not too pricy. North American copies are around $25 right now, with import copies from Japan running around half of that after shipping. 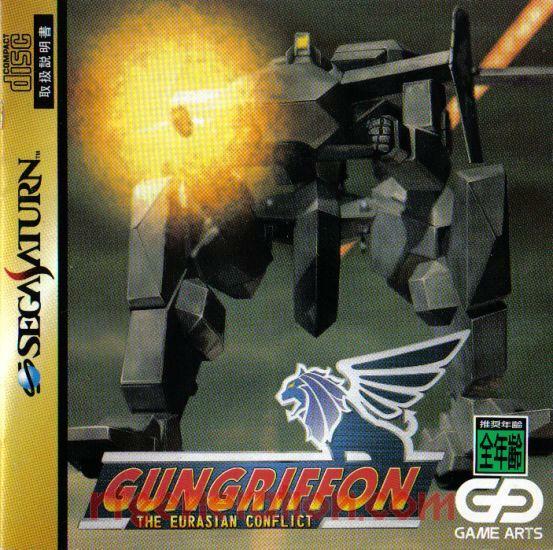 Gungriffon is easy to pick up and play in short or long bursts, and it may help to satisfy an itch to fire up the Saturn if you’re not in a fighting game mood.